Saugatuck Technology’s work with hundreds of independent software vendors (ISVs) indicates that for many, the technical aspects of the transition to the Cloud are often fairly well understood – even if the roadmap for success may take some time. However, what is less understood, and more dangerous to IT providers, are changes that are required in other areas of the business that are typically much deeper and harder to execute, and often entail much more risk. In fact, this is not merely a move to the Cloud but rather a transition to entirely new ways of doing business. Progress software and Saugatuck Technology have come together to provide this Saugatuck Strategic Report which provides guidance to ISVs in transition not just to the Cloud – but to entirely new ways of doing business, new requirements from customers and partners, and new opportunities that enable significant reward, and related potential risk. 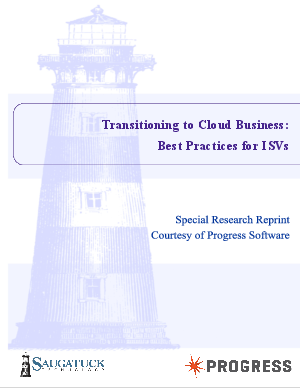 This report shares not only Saugatuck’s analysis of key market shifts, and the key challenges faced by ISVs in these transitions, but also provides ISVs with critical success factors and best practices from more than seven years of Saugatuck Technology research and business consulting with a diverse range of software providers around the world.